This summary was contributed by Andrea Wade on her blog and is reproduced here with her kind permission. 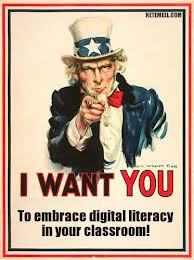 How can we increase teacher knowledge and awareness of digital literacy in English teaching? To what extent is it affecting/will DL affect how we teach English? The chat was lively and thought-provoking, as usual, and was expertly moderated by @Shaunwilden and @theteacherjames. We began the chat with a definition of DL supplied by @theteacherjames courtesy of wikipedia! DL is the ability to effectively and critically navigate, evaluate and create information using a range of digital technology, and recognising your own contribution towards developing the knowledge base both socially and academically. @esolcourses suggested that knowing how to apply DL is another important aspect, adding that it is as much about knowing when not to use technology as it is knowing how and when to use it. What does DL bring to the classroom and why should we teach it? This was a question raised by @efl101. @teflgeek added the concern that the problem is often ‘information overload’ with not enough time to critically evaluate it. We should, therefore, be teaching ‘critical digital literacy’ and helping students to determine which tools they should use out of the infinite number they could use. It was generally agreed that it is better to use a limited range of tools effectively than lots of tools half-heartedly. With this in mind, ‘top ten lists’ (e.g. ‘The Top 10 Note-Taking Tools’) are not very helpful – one tried and tested, highly recommended tool is far better! As @BobK99 pointed out, ‘Look at this great tool, now look at this one’ gives us a situation where we have solutions without problems which is a complete waste of time! @the teacherjames asked if we actually need to teach DL or is it enough to simply be aware of it? @MrChrisJWilson wondered whether teaching DL can get in the way of the language focus. @David_Boughton felt that we should equip our students with English and nothing more. I think most contributors, however, felt, as I do, that teaching DL is necessary and that it can and should be taught alongside and integral to teaching EFL (as a type of CLIL, for example). @teflgeek commented that if students are going to interact with the language in a primarily digital way, how is it not our responsibility to teach DL? As teachers, @Shaunwilden also reminded us that we need to be aware of the issues raised by sending students online and telling them to google something. It is our responsibility to teach them how to discern what is ‘good’ information and how to stay safe when using technology. @esolcourses is of the opinion that DL ought to be embedded into EFL courses as we need to be equipping our learners with 21st century skills. Being competent in DL is a means to an end, both for us as teachers and for our students. Several #eltchatters felt that we need to start with our students and their aims and only use technology if it is relevant to the lesson, but others suggested that, in today’s world, technology is ubiquitous and is, therefore, relevant in all circumstances. @bcnpaul1 pointed out that if we don’t teach DL, we end up with lots of copy-pasted work handed in, which is a waste of time for everyone! @esolcourses agreed and added that we’d be setting our students up to fail, especially where plagiarism is concerned. 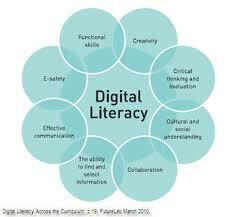 How do teachers become digitally literate? By joining online teacher communities, such as #eltchat. By learning from their students! 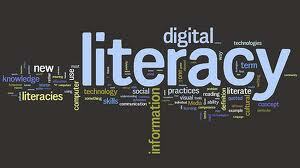 By incorporating digital literacy into teacher training courses. By appointing ‘digital leaders’ among students to promote technology use and DL. By colleagues modelling technology use during seminars on non-technology subjects so that they can see how it can be used effectively. How does DL affect the way we teach English? @teflgeek asked the question, ‘Have we got to the point where technology requires a different pedagogy, or can we continue to overlay the technology on top?’ @esolcourses answered that she felt that the core pedagogy is much the same, but that technology affords a lot more scope for learner autonomy. @teacherphili alluded to the different types of DL that we could/should be teaching, but we ran out of time to discuss them – the subject of another #eltchat, perhaps? !